After all these years, here, at the beaches in Delaware, I must admit that I had never spent a day at Gordons Pond in Rehoboth Beach. You probably think, who cares? 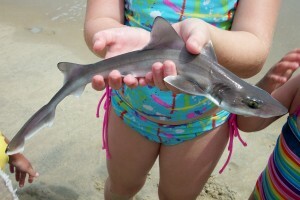 Well, hmm…when my kids were growing up, and I was living in Bethany Beach, then I would either use the beach at 4th street, on the north side of the town of Bethany Beach or I would drive up to the State Park beach right in Fenwick Island. Different beaches; both great. 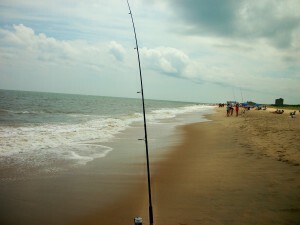 After the move to Rehoboth Beach, then I would use the beach at Tower Road, south of Dewey Beach. That beach was wide and plenty of parking. It has been a while since I sat a whole day at the beach. It seems that all of us friends are running in different directions, so we don’t see each other as much as we used to when our children were young and the beach was their playground. Yesterday, I went with Susie to Gordons Pond. 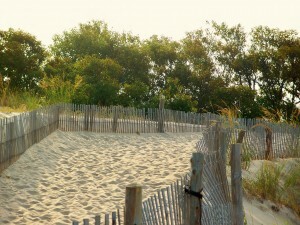 This beach is part of the Delaware State Park system. 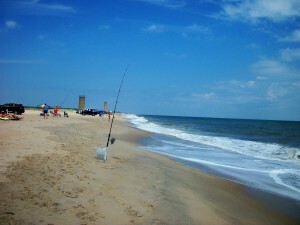 To access this beach you would have to take Ocean Drive and go all the way to the north end of Rehoboth Beach. The entrance will be right there. Gordons Pond is one of four migration “super highways” in North America; it is a popular resting spot for a wide variety of waterfowls. Friday was a perfect day for the beach since Thursday’s storm brought low humidity and sunny skies to the beaches. 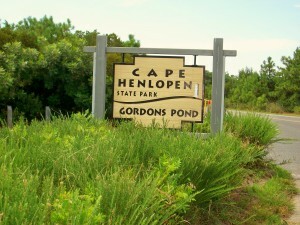 Being that Gordons Pond is part of the Delaware State Park system, you do have an entrance fee of $4 for in-state vehicles and $8 for out-of-state. The beach is wide and the sand was very powdery. Nice dunes protect this beach. For a Friday, it was somewhat crowded and more so as the day progressed. This beach had a dip as you entered the water and to me the water was freezing. I thought by now it would have been a little warmer. I took a walk towards the north side of the beach. On that side, it is permitted to fish. 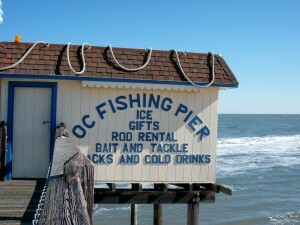 One of those fishermen had just caught 2 small sharks. Well, the kids were all excited and as I stopped they could not contained themselves; show and tell it was. 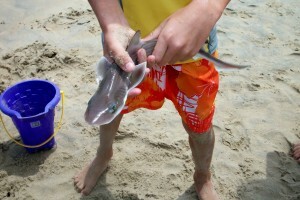 Do not worry, the sharks were going to be released. 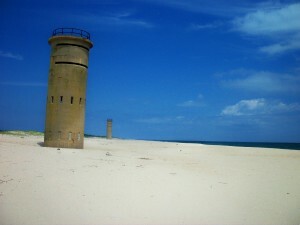 Further down the beach, standing guard, like ghosts from the past were 2 of the eleven WW II towers built along the Delaware and New Jersey coastlines. Eight of them are in Delaware. They were used as artillery spotting locations during that time in our history. I wrote a post about these towers on April 18th. If you would like to see it just click under Archives on the month of April and scroll down to the date. These towers are beautiful and stand lonely at the beach. These ones, at Gordons Pond, are particularly gorgeous. Back at my beach chair I continued to enjoy my day. Living on the coast; how lucky!! Talk to you later….have a great week-end…. You better take your appetite and dancing shoes. This event is for the entire family. It is the 21st Annual Greek Festival sponsored by St. George Greek Orthodox Church. Tel 410-524-0900. The Festival will take place: Friday and Saturday Noon until 11 p.m., Sunday Noon until 9 p.m. There is an admission fee. Location: Ocean City Convention Center located at 40th St. and the Bay. Expertly prepared tradional Greek cuisine – mousaka, pastsitso, stuffed grape leaves, baklava; made by professional Yiayias (Greek Grand Mammas). Food will be served all day starting at Noon. And, carry out is available, as well. There will be vendors featuring original and reproduction art, jewelry and clothing. Raffle tickets available. Greek band after 5 p.m. Traditional dance performances by the Hellenics. The Freeman Stage at Bayside offers a wide range of diverse and quality arts experiences to people of all ages and backgrounds. This Friday and Saturday an Arts and Jazz Festival will be the entertainment for those 2 days. Various Jazz musicians will perform on the Freeman Stage while local artists showcase their art on the lawn. Friday, 7/30, the jazz performers will be: the Jazz All Stars from 4 – 6 p.m. and Joe Baione Sextet from 6 – 8 p.m.
Saturday, 7/31 – Pam Miller Band will be performing from 12 – 2 p.m., Radio King Orchestra from 2 until 4 p.m., The Swingin’ Swamis from 4 – 6 p.m. and national jazz recording artist, Gregg Karuka from 6 until 8 p.m. 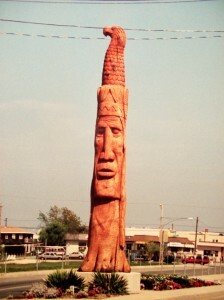 The Freeman Stage is located just 4 miles west of Fenwick Island, Delaware, at the intersection of Rt. 54 and Rt. 20. Just turn into the Bayside community and proceed straight on Americana Parkway. The Freeman Stage is located on Town Lake at the intersection of Americana Parkway & Lake View Drive. The address for your GPS? 31570 Lake View Dr., Selbyville, DE 19975. For more information, please call 302-436-3015 or visit www.freemanstage.org. They are also on Facebook. I love buying cookbooks. I read them like novels. And, I don’t discriminate; neighborhood cookbooks, different cuisines, fundraising and school ones. The last time I was in Boulder I bought a couple of them. They looked easy and a little innovative. One of them is called Amor y Tacos. 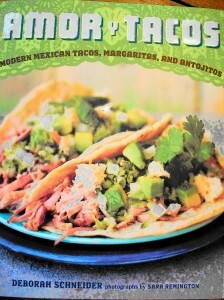 In it the recipes are modern Mexican tacos, Margaritas and appetizers. The author? Deborah Schneider. She combines the recipes of taqueros in roadside stalls in Baja with the ones in Tijuana. My son decided yesterday, after I had cleaned the kitchen that he wanted to make some tacos. With this book in hand he decided on the Lemon-Garlic Chicken Taco with Mezcal. The sauce in this recipe is spicy-lemon garlic flavor; almost like a variation of a Caribbean mojo sauce. The meat is to be tossed with all the great flavors of the marinade after it is cooked and not before. Pre-heat pan over medium heat. Toss the chicken thighs with the oil. Starting with the skin side down, cook the thighs until the skin is very crisp. Turn and cook them until done. When the chicken is cooked, slice it thinly or dice it. Place it in a bowl and toss it with the garlic and serrano chile, 1/2 tsp. salt, and a couple grinds of fresh pepper. Squeeze the lime and lemon juice directly over the chicken, add the mezcal (or tequila), and stir in the cilantro. 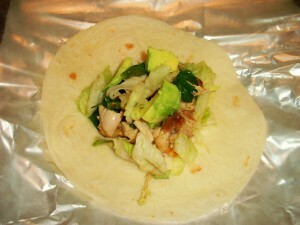 Serve wrapped in the warm tortillas with lettuce and avocado. Note: If you cannot find serrano chiles just substitute with a jalapeno, just like he did. This recipe turned out delicious; it is spicy but the combination is great. Note: Mezcal is made from agave throughout Mexico. The best ones taste strongly of alcohol. I love enjoy seeing my children cook. Talk to you later…. Last month I lost my driver’s license. I proceeded to go and sit for hours at the DMV located in Georgetown, Delaware. Did not even look at it until I flew to Florida a week or so ago and almost could not get on the plane. My license said on the top that it was not to be used for Federal I.D. They did let me go through but it was close. The moment I came back to Delaware I went back to the DMV. Thank God this was a very fast visit. By December 2014 we all need to get a Federally Compliant Driver’s License. This license/identification card will be sufficient identification to fly domestically, travel by train, enter federal facilities, and conduct other offical federal business after December 1, 2014. All states are going to be on board with this regulation. After the above mentioned date, you will not be able to use your regular license for those purposes. The new compliant license will have a gold star on the upper right-hand corner. 1. Birth certificate issued by the Bureau of Vital Statistics or State Board of Health (wallet cards, birth registration or hospital announcements/records are Not accepted). 2. Social Security Card or Official Letter issued by the Social Security Administration (SSA) containing social security number. 3. Two proofs of Delaware residency that includes applicant’s name and is postmarked within 60 days (i.e. ; utility bill, cable bill, voter’s registration card or junk mail; personal mail is Not accepted). 3. Legal name change documentation if applicable (marriage license(s), divorce decree(s), court order(s). Please note that if you do not have a passport, and only have a birth certificate, but are married, then you need to bring the documentation that supports the legal name change mentioned in #3. Since I did not know this when I went to get my duplicate driver’s license, I only got a Non- Compliant license and had to go back with all my documentation. I just want to save you that extra trip to the DMV. You know what I mean. See you, and talk to you later…. It seems like it was yesterday when I wrote my first post for my blog. Actually, yesterday, Tuesday was the one year anniversary of AboutMyBeaches. I have to thank Ed Timmons from 4C, Inc. for guiding me and being my webmaster. You may reach him at 302-228-3255. Website www.4cinc.com. Once he set me up I took off running, talking, writing or whatever you want to call it. On that first post I talked about defining the meaning of being a “local”. That post stands the same today; Barry still thinks I am not a local; like he is one himself. He reminds me time and time again, among other comments. He is a great friend, so that’s why I can talk like this about him. What he was not prepared for was to hear that Sharon, considers me a local but not a native like she is. That Missy was claiming me, that Cindi, a native from Lewes was also claiming me, as well. Our good friend, Craig, no longer with us wrote to my blog that day, along with Marcy, Roberta, Shelley, Trish. These are some of my good friends that have supported my “concierge journey”. I cannot forget the other friends that have gone along with me kayaking, like Debbie. Walking on the boardwalk, Alice. Donna and Anita in Florida; one checking a new hotel and the other checking an artist. My family and friends that have endured my picture taking at restaurants; not letting them take a bite until I was ready and having every one at the table ordering different items so that I could talk about them. I was shocked when an invitation came from the Rehoboth Historical Society and Rehoboth Beach Museum addressed to “members of the press”. I had to e-mail them back thinking it was a mistake. But, it wasn’t. I was really invited. How neat!! A person wrote after a restaurant review was not of his liking. What were my credentials, he asked? I don’t have any, really. But, what I do have is common sense and I know how I should be served and treated at a restaurant. He wondered how could I critique after just ordering a couple of things off the menu? I could just have ordered water and had an opinion, really. I enjoy going out to dinner; discovering new places, passing the word around. That’s why this blog is my diary. Open and sincere. Cooking is another of my passions. You have seen my recipes. I am no expert and some of them….well, don’t you remember the “pasteles” I made? It looked like somebody had thrown up on the plate. The funny thing was that it looked ugly but it tasted delicious. AboutMyBeaches is on Facebook and Twitter. I, myself, am on Facebook and Linkedin. What this has done for me, personally, is a reconnection to all of my old friends. The “Igualitos” from Puerto Rico and a few others I had not seen for 38 years. That, really, has been priceless. Rediscovering the Island of Puerto Rico was amazing. Only when you have left it, you learn to appreciate it more, even with all its deficiencies; the sounds, the sirens, potholes, tapones (traffic jams). Its beauty, the mountains, coconuts, rain forest, the beaches; and of course that “comida criolla”. Now I do have to brag a little. As of today, including this post, I have 353 posts, 874 comments, 763 tags. From 6/27 to 7/27, 7,470 people hit my blog. On an average, and depending what my topic is I have between 190 to 275 plus people hitting it daily. I am excited!! Thanks to my advertisers; but I do want more. No website? No problem, $175 for 1 year. I have mentioned before that I practically go to the grocery store every day. Regarding dinner, I never know what will strike my mood as that favorite time of the day approaches. Some times I like to cook but in order to write a post to the blog I need to go out and have someone else cook for me. Such was the case last night. My mood? Sashimi. 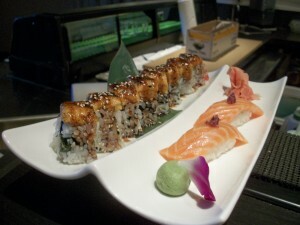 That’s what I eat when I go to a Sushi restaurant. You know, sashimi is usually the first course in a formal Japanese meal. The reason is that it is considered the finest dish; it should be eaten before other strong flavors affect the palate. I went last night to Saketumi. 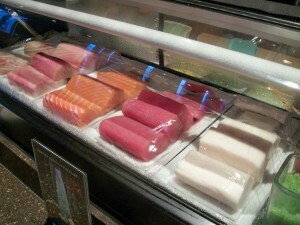 It is my favorite at the beach for sushi or sashimi. 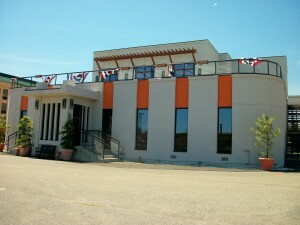 It is located at 18814 Highway One, (Rt1 or Ocean Highway), Rehoboth Beach, DE 19971. Tel. 302-645-2818. 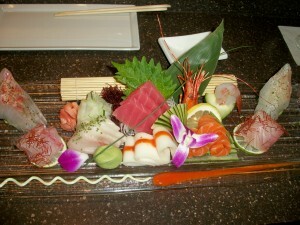 Website www.saketumirestaurant.com. 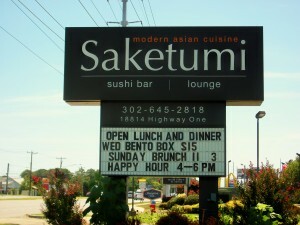 Saketumi is a modern restaurant specializing in Asian cuisine. They have take out, catering, Japanese, Thai, and Chinese. They serve lunch, dinner and brunch on Sundays. Saketumi has plenty of parking available. And, if you are visiting or are a resident you know how important that is at this time of the year. I like to sit at the Sushi Bar. I get to see what is going on and interact with the Sous Chef. At Saketumi, this would be Tanaka San. He is an artist when it comes to presenting the food. Just gorgeous. You hate to disturb the plate. Tanaka has always presented me with an appetizer. I have asked him so many times what it is that I am eating, but to tell you the truth I cannot understand what he says to me, so, I just eat and enjoy it. 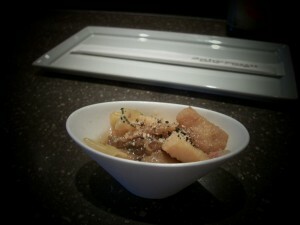 The fish is in a vinegar sauce with a little bit of onion and I love it; I really do not know what it is, though. I could not help but take pictures of some of the dishes being prepared. The tuna sashimi looked delicate. The Tuna Tuna Surprise or TTS was so colorful. 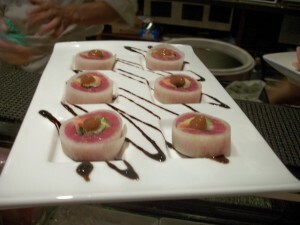 It had inside-blackened tuna, asparagus, sweet goma sauce and wasabi aioli. 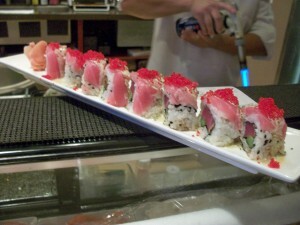 Outside-akami tuna, tobiko, chive. The Dynamite was also beautiful. 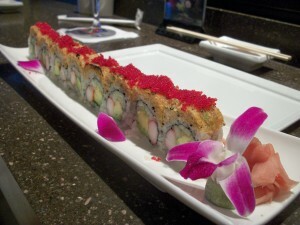 It was a baked California roll, with spicy mayo, scallop, fresh crabmeat and masago on top. A version of the Dynamite was ordered. To make it gluten free no masago was put on top. Extra tobiko on top. Tobiko is flying fish roe. Very good. My dish was called Pine Sashimi. Strictly Sashimi for me. It had tuna, yellowtail, salmon, sawara, albacore, kampachi, madai, izumidai, hirame and botan ebi. Got it? It was to die for. The presentation? A work of art. The albacore (tuna) was white. I had never had it. It was meatier, soft and buttery; melting in your mouth. What else can I say? I have gone so many times to Saketumi and I can honestly tell you that my service at the sushi bar and the food have been excellent. 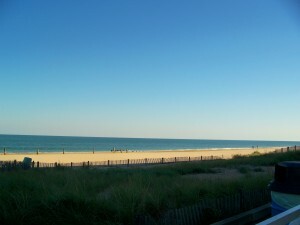 Bethany Beach is where my children grew up. This town is so popular with families. Even at the height of the season, when it is so crowded, you still can feel that small town atmosphere. Wednesday, 7/28 and Thursday, 7/29 – It is the 19th Annual Beach & Bay Cottage Tour to benefit the Friends of the South Coastal Library. The event will take place from 9:30 a.m. until 4:00 p.m. Tickets are $30 and can be purchased at the South Coastal Library, 43 Kent Ave., Bethany Beach, DE 19930. In Bethany: Cattails, Perfect Furnishings, Japanesque, Sea Needles, Wear It Out. 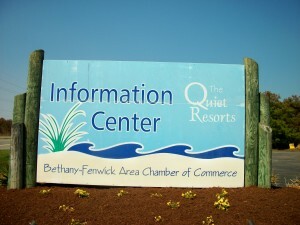 In Fenwick Island: The Bethany/Fenwick Chamber of Commerce, Carolina Street and the Rooster’s Nest. This event has been selling out since 2000 so get your tickets as soon as possible. Wednesday, 7/28 – 1st State Harmonizers will be performing at the Bandstand. The performance will begin at 7:30 p.m. This is a men’s barbershop choral group. They preserve the barbershop music as an art form. It is a style of a cappella, or unaccompanied vocal music. Friday, 7/30, Saturday, 7/31, Sunday, 8/1 – Bethany Beach Yoga – Drop in Fee. Location: Boardwalk and Bandstand. Time: 6:00 a.m. – 7:00 a.m. More info? 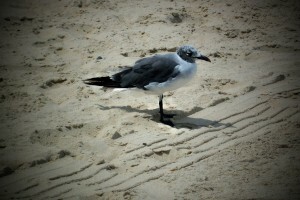 Please call 302-537-7838 or visit www.bethanybeachyoga.org. Friday, 7/30 – The City of Fairfax Band will be performing at the Bandstand. It will start at 7:30 p.m. The Band is celebrating its 40th year anniversary. The programs are varied and present the best in classical transcriptions, wind band music, military and marches, show tunes and much more. Saturday, 7/31 – Randy Lee Ashcraft & The Saltwater Cowboys will be performing at the Bandstand at 7:30 p.m. This is country music and the performance is new this year at the Bethany Beach Boardwalk. Sunday, 8/1 – A Buddy Holly Tribute at the Bandstand from 7 – 9 p.m.
Have a great week and remember that you are at the beach so relax and kick back….that’s why you are here! !